The 'perfect' combination inspired by Dr Weston Price, who noted that the two oils together had the most benefit to his patients. Imported from the USA, Green Pasture's natural cold fermentation oil extraction process yields an exceptional naturally high vitamin cod liver oil. 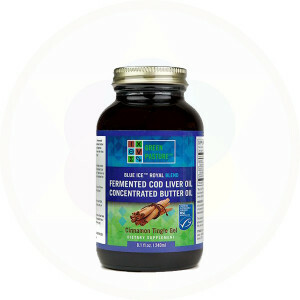 As no heat is used in processing, this cod liver oil is able to retain more nutrients, omega fatty acids and enzymes along with naturally occurring vitamins A and D. Fermentation also allows for easier absorption and digestion of this whole food superfood. Dr. Price's research revealed that 'Activator X' is a fat-soluble nutrient found only in butter and the organ meat of animals fed a diet of rapidly growing green grass. It acts as a catalyst to help the body to absorb and utilize minerals and even aids in rebuilding body tissue, bones and teeth. He believed that the combination of the cod liver oil with the X-Factor butter oil had amazing healing properties. Green Pasture Blue Ice high vitamin fermented cod liver oil is cold processed in batches and then tested to maintain international purity standards to ensure the freshness and taste of this outstanding, energy boosting oil. Fermented Cod Liver Oil, High Vitamin Butter Oil, silica. Please note: Some people find the taste, smell, and texture of fermented cod liver oil to be offensive; therefore, Green Pasture does not guarantee their product based on personal taste, smell, or texture preferences. AllisOne will only accept returns on unopened cod liver oil products.